In rounding off my challenge for the year, I thought I would end on some of my favourite books. So I chose to reread Marley and Me. And yes, I loved it just as much this time as I did the first time I read it back in 2006. And yes, I cried just as much this time as well! John writes a memoir of life with his dog Marley. But the book looks at much more than just the antics of a dog. It also looks at John’s growing family, the relationships that are formed and the large impact one dog can have on a whole family. 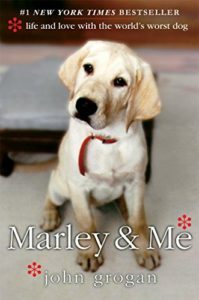 The book focuses on Marley’s action from a puppy to his last days. It provides many anecdotes around his mischievous ways, his catastrophic ways, his phobia of thunderstorms, his fierce loyalty, his gentleness and protectiveness of the kids and his positive happy nature. The book is a beautiful ode to a well loved dog. But rather than just being all sappy, John creates a perfect balance between the character of Marley with the real life implications and troubles. The book makes you laugh, shake your head and cry. Being a pet owner myself, and growing up with all kinds of animals, including dogs, I certainly understand the joy and pain that animals can bring to you. It is a very well written beautiful book and I give it 5 stars. The movie is also a fairly good watch for anyone interested in seeing that adaption. Share the post "Get the tissues ready for this one!"